Digital Audio Broadcasting (DAB) is a digital method for broadcasting radio stations. The rtl dongles official driver has DAB decoding capabilities. But when the rtl dongle is used as a software radio, this capability from the original drivers can not used. 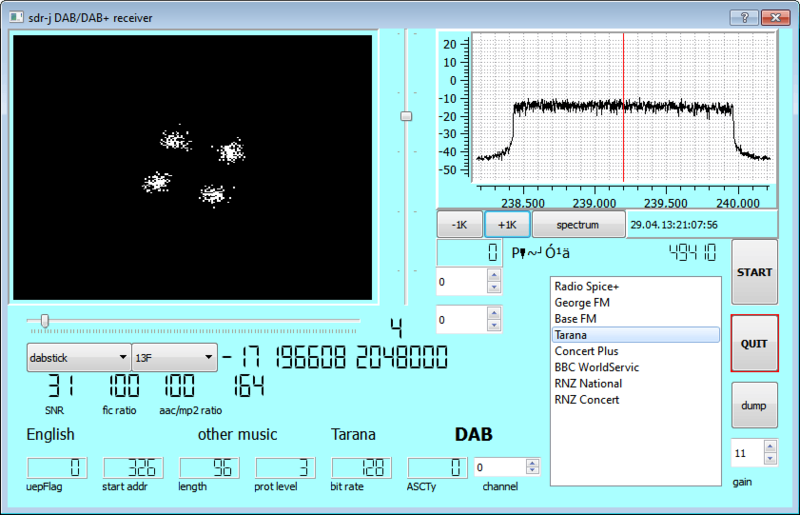 SDR-J is a SDR package for Windows and Linux which is capable of receiving FM radio and decoding DAB radio completely in software. YouTube user Superphish shows a video of SDR-J decoding and playing DAB music with a rtl-sdr dongle. Download the latest version of SDR-J here. To use it on a Windows system, simply unzip the file, and run “dabreceiver.exe”. Select dabstick on the left most drop down box and click start. Next you will need to find out what frequency block DAB radio is assigned to in your area. Note that not all countries have DAB radio. In my area, block 13F has DAB radio assigned to it. Use the second drop down menu to select the correct block. Once that is done you should see a flat topped signal in the spectrum graph, and some white dots in the left box. Adjust the sliders if you can not see everything and also adjust the gain setting in the bottom right corner. Radio stations should begin to populate in the list on the right. Click on one to listen to it. Check out the SDR-J manual here for more instructions and more information about the options available. If you are trying to run SDR-J on a Windows system you may get an error message that one or more .DLL files cannot be found. I experienced this error when I tried to run the excutable. I took note of the missing .DLLs and found that they were all in the directory where the executable was located. I copied all of the missing .DLL files to the c:\windows\Sytem32\ folder. This time Windows could find them and SDR-J is running fine. I have found three blocks within BAND III with over 30 stations between them. A nice piece of software which I am sure Jan van Katwijk will continue to develop as long as he receives positive feedback. Dont waste your time with this clunky junk. Its not user friendly, and lacks functionality. Just get an adapter to run your sdr dongle off an android phone and use wavesink plus. Problem with unicode symbols. In Polish DAB system – national radio use local names as PR Dwójka, PR Trójka, PR Czwórka. When I try to switch to this stations I got informations about GUI: Wrong language )44). It is possible to resolve this problem? When station names have only ASCII symbols then works good. (PR Jedynka, Radio Dzieciom, Radio Poland, Radio Rytm, Polskie Radio 24). I would like to use dabreceiver in Germany, is it possible that the displayed frequencies don’t work in Germany? Hmm, please ignore my first post. I’m testing again, hmm, I would like prefer 5C, but with a simple antenna not really possible, Channel 11D “works”, more or less. Can you please update your program (resizing, channel manager)? Bug is in spectrum if I click on it, program close in Windows 8.1. I downloaded the software and installed it and it is mostly working well, however, there are some weak stationsthat sound of R2D”,but.I expect that is due to my small indoor antenna.. I am located in the London/Essex-UK area and I am sure it is a good reception area. Changing stations from the drop-down list is not user friendly, I often find that the station name highlights as though I am attempting to type in a new name for the radio station. I use a Newsky SDR Dongle and it works very well. I bought mine from the following company and they are cheap and provide many accessories. They are located in the Channel Islands. I am just a satisfied customerand do not have any association with the company. I thought that the information may help other SDR users. Good luck and thanks for the software (73). Might there be something wrong with that header? All needed libs are installed. Try to install library “portaudio19-dev” this worked for me. oh, and seting the DAB software in waterfall mode wil helps alot. Using an Acer laptop 64bit Win7 and downloaded, installed downloaded files into the program directory. Plugged in a mobile whip to the RTL-SDR,( indoors by the window), followed the setup in the manual (didn’t download anything else but do have sdr# already on this laptop). Receiving the 3 expected multplexes, BBC, Digital one and the local multiplex- Liverpool. Have had nothing but trouble since attemting to use SDRj software. swbackend, frmradio and swradio have nothing to select under “input options” and the mini-receiver generates nasty hiss but fails to receive anything usefull. So my search for a useable SDR DAB program continues..
have you the possibility to make a 32 bits version for windows ? I’m not the programmer, but I believe there is no 32-bit version at the moment. You might want to email the programmer to try and encourage him to put out a 32-bit version. I think the Linux version works on 32-bit machines though. Proceded with zadig, installation successfully completed. View the main screen but failed to open rtlsdr.dll, witch is in the directory. Hmm you didn’t by any chance replace the rtlsdr.dll that comes with SDR-J with a different one? SDR-J comes with a rtlsdr.dll that works, if you replace it with a newer one it fails. ///… the rtlsdr.dll that comes with SDR-J? Ok I’ll try with the original SDR-J one. I think Zadig replace this file, so maybe we don’t have to use Zadig. rtlsdr.dll are now the SDR-J one. It should be compatible, SDR-J works with my E4000 and R820T’s. I think there is just a software issue somewhere. Best to email the developer at [email protected] and ask for help. I have RTL2832 R820T too, but the same issue as VE2DSK. Just bought a Realtek 2832 USB tuner from HongKong. It came with a windows driver, but no other software 🙁 Not exactly ready to use! This looks like it might do the trick. I’ll try it sometime, thanks. Hi, no seller is going to provide sdr instructions with the dongle. Sdr is an ‘off label’ use of these particular tuners. Go to my quickstart page that’s linked to on the top menu of this site for easy Windows instructions. Unless you only want DAB, in which case it is odd that they didn’t supply software to take advantage of the dongles hardware DAB features.